The Professional MIDI controller that redefines the virtual piano playing experience. Kawai proudly introduces the VPC1, featuring unparalleled keyboard action realism, impressive hardware/software flexibility, stunning piano-like design, and strong backing from the industry’s leading developers. The VPC1 is a professional MIDI keyboard controller developed especially for use with virtual piano software. 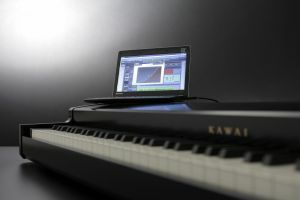 This unique product – the first of its kind from any musical instrument manufacturer – draws upon Kawai’s 85 years of knowledge and experience crafting the world’s finest acoustic and digital pianos, to deliver the ultimate virtual piano experience for the home, studio, and stage.